This quick and easy garlic knots recipe uses store-bought dough to speed things up. Photo courtesy of Just a Taste. Garlic knots are one of the most popular garlic recipes and this one is a great way to get started with making your own garlic knots at home. Be forewarned: make plenty as these are addictive and go quickly! Garlic knots originated in the northeastern U.S. and were originally a way to use up older batches of dough and scraps left over from making pizzas and bread. This recipe calls for using store-bought dough but feel free to make our own homemade dough if you’re so inclined, as serious garlic knot aficionados often make the dough from scratch. Garlic knots pair well with just about any dish bu are great with pastas as well as with soups; once you start eating them they might just turn into a meal themselves, especially when hot and fresh right out of the oven! 1. Lightly flour cutting board or working surface and roll out half the dough into a 10 inch square. Cut the square in half with a knife and then cut dough into strips roughly 5 inches long by 1 inch wide. It doesn’t half to be exact as you’ll be tying these strips into knots. 2. Tie each strip into a knot as you go and place them on a baking sheet lined with parchment or lightly oiled. There’s no right or wrong way to form the knot so don’t sweat this too much. 3. Roll out the remaining half of dough, cut into strips, and tie into knots the same way. Leave a little space between each knot on your baking sheet. 4. Preheat oven to 350 degrees while making your knots and keep dough covered under a kitchen towel when not working with it. 5. 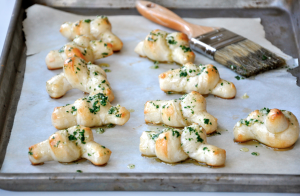 Bake garlic knots for about 10 minutes or until they’re golden brown. 6. 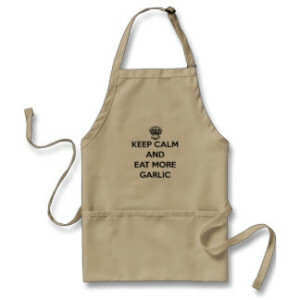 As knots are baking, mince your garlic and parsley and melt butter in a sauce pan on low heat. When garlic knots are done, remove from oven. Add garlic to butter and let it cook for 2-3 minutes. 7. Remove sauce pan from heat and add salt and parsley to butter and garlic mixture. Stir well then brush liberally onto garlic knots.